Oh wow, you don't say. Thanks for bringing us up to speed here. "Thanks for your email. Recently, due to changing market conditions and to meet an increasing demand Mountain West Properties has decided that 1011 Burdett will now be offered as high end rental accommodation when complete later this year. As a result these homes will no longer be offered for sale. Developer is in the process of updating website and signage to reflect this." I think the brick is overdone. Too much. What, no welcome for Art after providing that info? Oh dear, did not notice. WELCOME ART! And as always, we REALLY enjoy new members that come bearing gifts (great information). Very interesting change in use on this project! Haha thanks all...I've been lurking for a while (in the market for a condo) but figured since I had some news I should contribute. 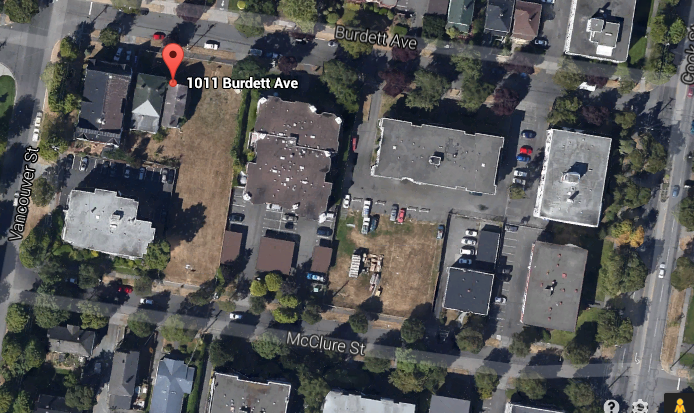 Looks they purchased a handful of properties in order to make up 1011 Burdett. Perhaps they paid too much for the land and their prices that rolled over were just too high? I still say THAT'S A LOT OF BRICK. Windows seem quite small, but I really do love the look of it. Nice finishing details. Clearly this was not intended to be a rental at the design stage. I think it fits well into the neighbourhood. Haven't spent much time in the east? There are whole neighbourhoods filled with brick buildings like these in places like Montreal, Chicago, Ottawa, TO, NYC etc. It's all about what you're used to. Im sure this is a very high quality project, but I have a feeling they may have switched to rentals because they weren't selling. Just not what the market wanted I guess. Ya, and I really like them. Just somehow this one does not strike my fancy. I think you are right. We went through their show office in the hearitage house on Mclure and I thought that they were way too expensive for what was being offered. They were nice, but really average finishings with very small suites at top of the local market prices per sq ft seems to have equalled no sales. I think they misjudged the desire for people to live in that area and pay a premium to do so. ... I think they misjudged the desire for people to live in that area and pay a premium to do so. So what do they think people are willing to pay to RENT in that area? Do you recall what the price per sq. ft. was? That's another no seller for them. And their Vic West office proposal never got off the ground. Are you speaking about Harbour Landing? Really? No activity there at all?